A Bowen family web historical reference series e-document. This information incorporates as many battles as I have found reference to in various publications.No distinction has been made as to the number of combatants to distinguish "battles" from "skirmishes" or "incidents". We will make available here as many encounters between Owain Gly Dwr's forces verses those aligned with The King of England. Whenever information detailing the specifics of a battle or a brief related event is available we will include it for perspective. Lands claimed by Owain Glyn Dwr and Lord Grey of Ruthin are awarded to Lord Grey by the English Royal Courts which sparks the Owain Glyn Dwr led Welsh revolt . 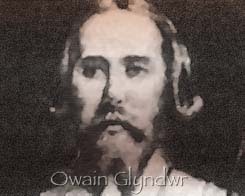 Angered over the Royal courts decision not only favoring Lord Grey,but also ridiculing Owain and the welsh people,Owain Glyn Dwr as his followers proclaimed Glyn Dwr Prince of Wales gathered his men together,at his estate of Glyndyfrdwy in Merioneth. Present were his brother,his son and his brothers-in-law,and several members of the Welsh clergy. Glyn Dwr raised his standard and attacked Ruthin. 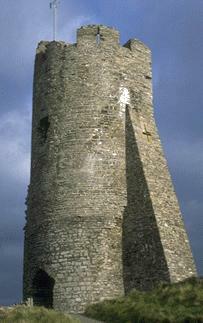 Owain's campaign began with an attack on the castle at Ruthin, entering at dawn to fire what they could. Similar attacks were to follow at Flint, Rhuddlan and Hawarden. His followers came from all walks, farmers, mercenaries and Welshmen returning from England to swell the ranks. His tactics were those of surprise attacks and his army was no doubt swelled by many local people, who were to be known as Owain's children, who would seem to melt away to return to everyday life after the battles. It was on Good Friday, in 1401, when the castle was garrisoned by some 75 Welshmen in the pay of the English crown, that Conwy fell to a group claiming allegiance to Owain Glyn Dwr. One story has it that most of the garrison were at church when a carpenter persuaded the guard to let him in. Once in he then let through the gates the supporters of Owain Glyn Dwr. The supporters were led by Gwilym Tudor and Rhys Tudor. Harry Hotspur, as chief justice of north Wales, was sent to remove them. Those in the castle surrendered nine of their number on condition that the others were pardoned. 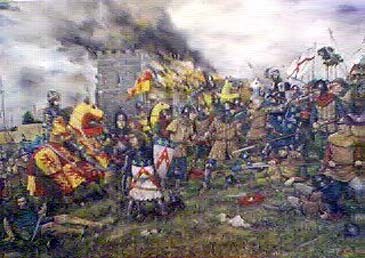 Owain Glyn Dwr defeats the forces of Henry IV. Owain and a few of his followers crossed Pumlumon mountain to the river Hyddgen. An army of men from Ceredigion, both Welsh and English, came to fight against him. The Welshmen decided to change sides and join Owain, and they drove the English soldiers away. Reginald Grey is captured and is later ransomed for a massive 10,000 marks (�6,666). In June 1402 Owain Glyn Dwr led a force into Radnorshire. He was intercepted by "almost all the militia of Herefordshire" under the command of Edmund Mortimer, which would have been largely made up of tenants from the Mortimer estates. The two armies met near the village of Pilleth, a few miles from Presteigne. The chronicles imply that the battle took place on the hill above Pilleth church, Bryn Glas ("Green Hill"). As with all accounts of battles in the middle ages it is impossible to be sure of the numbers involved, but Mortimer's army could not have consisted of more than 4,000 men. It seems probable that Owain's forces took up a position on the hillside, and that Mortimer's army advanced up the hill to meet them. At the crucial moment, however, their own archers turned on them and they were utterly defeated. The slaughter was said to be horrendous, and accounts put the numbers killed at between 200 and 1,100. This was one of the most significant moments of the rebellion: an English county levy had been utterly overwhelmed by the Welsh. Reports also quickly circulated that the Welsh women accompanying Owain's army had "obscenely mutilated" many of the bodies of the fallen. Mortimer was captured, and when the English government procrastinated over his ransom he threw his lot in with the Welsh, marrying Owain's daughter on 30 November 1402. 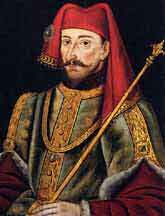 As his claim to the throne was arguably better than that of the king, Henry IV, this was a serious development. Local tradition indicates that the bodies were buried in mass graves on the hillside and six Wellingtonia trees were planted to indicate one of the sites; although no records exist to substantiate this claim, it is quite possibly true. England's Henry IV crosses the border into Wales. Homilden Hill near Wooler. 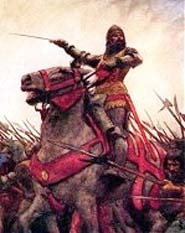 Hotspur and his father defeated Archibald, Earl of Douglas and his army of 10000 Scots. The Douglases were great enemies of the Northumberland Percys. 800 Scots were killed in their defensive position by English archers shooting uphill. 500 more drowned trying to escape over the Tweed. Douglas was captured having received 5 wounds including the loss of an eye. The Percys quarrelled with King Henry IV about their captives and as a result joined forces with the Welsh rebel Owen Glendower. : NOTE :The first Welsh Parliament is held at Machynlleth. Coronation of Owain Glyndwr as Prince of Wales at Machynlleth. The garrison at Criccieth had been strengthened: the constable, Roger Acton, had 6 men-at-arms and 50 archers at an annual cost of �416. 14s. 2d. A French fleet in the Irish Sea supported Glyndwr and stopped provisions reaching the castles (Criccieth, Aberystwyth and Harlech) by sea In the spring of 1404, Criccieth fell to Glyn Dwr. Criccieth Castle and the borough were burned. 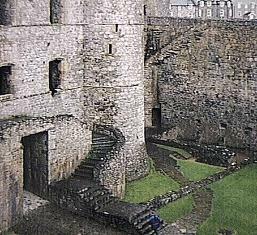 The Castle was never rebuilt and the borough slowly recovered but was no longer a garrison borough and became wholly Welsh. Castell cadarn a'i safle grymus ar ben y graig. 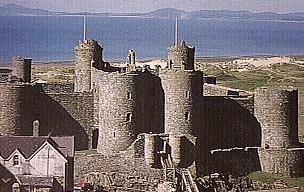 Harlech and Aberystwyth Castles are captured by Owain. A Welsh force led by Rhys Gethin is defeated at Grosmont. "The Monmouth website records that this battle took place in 1402 1.25 m sw Mitchel Troy, Mons and that Owen Glendower's forces beat those of Henry of Monmouth (later Henry V)"
The red Welsh dragon "Y Ddraig Goch" owes its origins to folklore and Arthurian legend. Originating from a serpent representing the Welsh God Dewi, Celtic King Arthur was said to have had a dream about a red dragon (symbolically representing Wales) which slayed a white dragon (which represented the Saxon invaders). In later times a crude red dragon design was adopted by Prince Llywelyn of Gwynedd in the 7th Century and taken into battle by Welsh hero Prince Owain Glyndwr in conflicts with the invading English. In later history, at the Battle of Bosworth, Welsh-born King Henry VII (Henry Tudor, crowned 1485) unfurled the red dragon, which he in turn had adopted as his own emblem. As such, the beloved red dragon has always represented the defiant Welsh nation; iconising Wales's unique cultural and historic heritage as a proud and ancient nation which has long survived external threat. The Welsh dragon is often associated with the motto, "Y Ddraig Goch a ddyry Gychwyn" - or "The red dragon will show the way". Hyddgen is now in Powys but it was called Radnorshire. Many of the soldiers on the 'English' side were actually Flemings who had been settled in Pembrokeshire and were classed as 'mercenries' by the Welsh as they had usurped Welsh lands. They were summarily executed if captured. Craig y Dorth (Battle of.) is near Monmouth not Abergavenny. I know the owners! Interestingly, the Welsh Assembly Government recently commissioned an archaeological examination of the Pilleth/Bryn Glas alleged battlefield, and they found nothing which would relate it to a battlefield. This has happened now to several 'battlefields' in Wales. I suppose time takes a hand, but after any battle, the field would have been cleaned of any usable items, and iron was a valuable commodity, but you would expect to find something! However, the Welsh refer to anything over the height of a molehill as a 'mountain', so could it be the same with 'battles'. I suspect many 'battles' were little more than skirmishes with relatively small numbers involved. Just look at the numbers which were used to garrison castles. One 'man at arms' and 12 archers! Not much of an army. The population of Wales at that time would also be very small compared with today. No large towns or cities. Cardiff at that time had just over 1000 of a population if that. 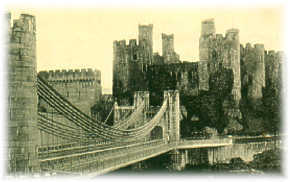 Newport was a village even Chepstow was no more that a small market town within its walls. At Pilleth, great store has been put upon 'Wellingtonia' trees being planted to mark the grave site. This could well be the story for the Victorians, as Wellingtonia were not brought to UK until the mid 1800s. Large estates often planted pine trees on natural or man-made mounds to mark visual location points for the local fox hunts to assemble at during a hunt. I know from local knowledge that many bronze age burial mounds were so treated. What we need is real excavations to establish the 'truth'. Anyway. I enjoyed your site. If I come across any more items for you I will be in contact.